The birthday socks were delivered, so I can show them now. These are for the daughter who has many Dr. Who items on her Etsy shop. She has stitch markers, earrings, necklaces and posters among other things. The socks seemed perfect. They represent a TARDIS box, which is what Dr. Who uses in his time travel. I'm still battling with the cotton sweater. 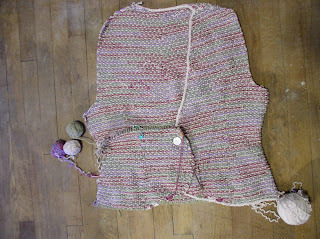 After frogging the back down to the armholes, I finished it in a size that fits me. I knit one side of the front and sewed it on. It's starting to look like I want, although the neck decreases didn't work out as originally figured. I knit the other side of the front and sewed that on. The button side was bigger, by about an inch. No wonder my decreases hadn't worked out the first time. 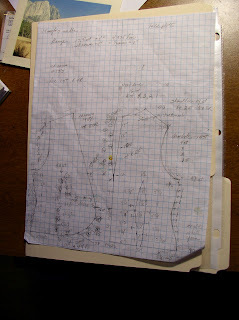 What you see here was frogged to the armhole (sound familiar?) and reknit after finding I was running out of stitches near the shoulder.I an getting tired of this! 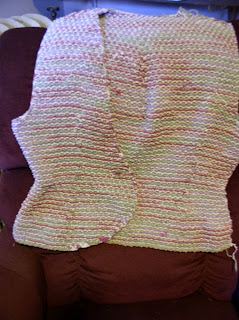 I pouted and pondered and when I went to knit night at the yarn store, I decided to try edging the sweater. I'm using a two stitch I-cord. Got home from the yarn store, and frogged the buttonhole side of the sweater until I had about an inch left. That was the part that matched. I'm moving my way back up again. By the way, the button is an antique mother-of-pearl button from my mother's button box.The color is perfect with the ecru cotton and there is a design inscribed on it so it's not monotonous. Perhaps you are wondering how I could have so much trouble with following a pattern. 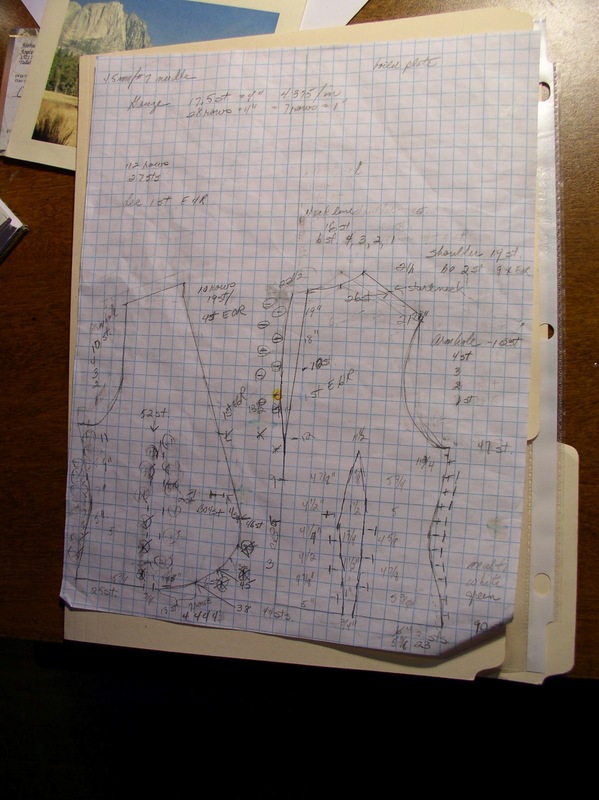 the problem is that I took a sewing pattern for a jacket and put it on graph paper, using one square for each inch of pattern. 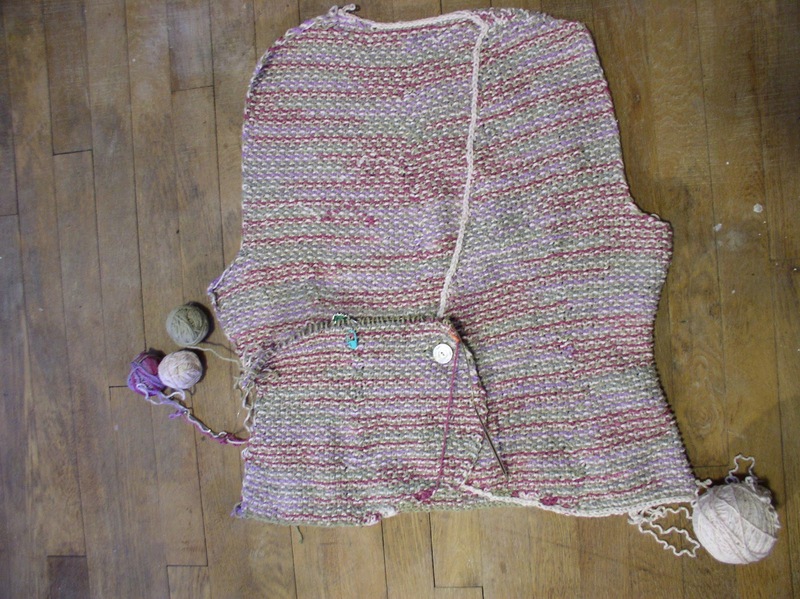 I then got stitch and row gauge off the sweater I was dis-assembling and am trying to figure how many increases/decreases for each inch of shaping.The decreases from waist to neck would have worked out on the first front piece if there had enough stitches when I got to the waist. There are times when I'm sure I am, crazy for continuing on this project. I wonder if there is bad luck in the yarn. This is the third sweater for the variegated yarn. Sweater #1, a long time ago, was poorly written pattern and the yarn didn't work. I had combined it with the ecru at that time. Version #2 was the result of a class with Lily Chin on color. The fabric is a three color seed stitch.After the class, I was able to pickup the country green that blends well with the other colors. I'm keeping the seed stitch fabric and I hope that the third time is a charm on the knitting. As I keep frogging, I wonder! The good point is that the fit will be good. Oh my, I love the TARDIS socks! I would really love to have a pattern for these, and would gladly pay for it. Did you design them yourself? I love what I have seen on here in terms of your work, and would love to see more, and or patterns! Thanks for sharing. I also really like your daughter's Etsy store! 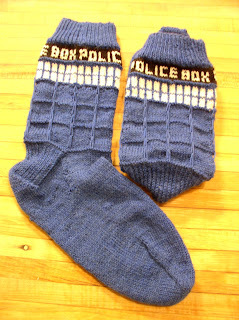 Oh my, I love the TARDIS socks! I would really love to have a pattern for these I would gladly pay for it. Did you design them yourself? I really love what I have looked at on here, and want to see more and more patterns. I also really like your daughter's Etsy store. Thanks for sharing it. The TARDIS socks are a free pattern on Ravelry .